A Spanish expedition in search of Monterey Bay led to the accidental “discovery” of San Francisco Bay in 1769 from atop a ridge in today’s San Mateo County. After sighting the Bay from Sweeney Ridge on November 4, 1769 (the first sighting of the Bay by Europeans), Captain Gaspar de Portolá with his 60 men hiked south and camped along the San Francisquito Creek from November 6-10 before retracing their path back to Baja-California. The story is online. To mark the 250th anniversary of this event in 2019, an effort is underway to tell the story of the expedition and of the native people who greeted the Spanish warmly but whose lives and culture were nearly eradicated within a few short years. San Mateo County Parks Department in collaboration with county, state, and federal agencies, and tribal representatives is creating a trail system that will recognize 10,000 years of the Ohlone people in San Mateo County and follow the footsteps of the Portolá expedition into Alta California and the discovery of the San Francisco Bay by the Spanish. The goal is to designate a 90-mile trail that traces the steps of the Spanish expedition and highlights the native people they encountered. California Registered Historic Landmark No. 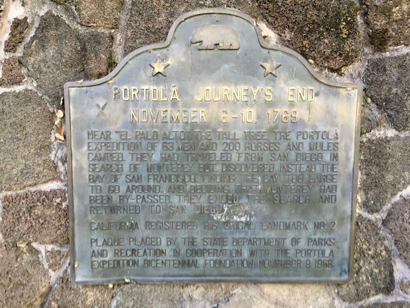 2 commemorating Portolá’s trip of 1769 and recognizing his party’s camping alongside the San Francisquito Creek (presumably on the Menlo Park side) is located at the southern end of Alma Street. There will be a Public Information Meeting to learn about the Ohlone-Portola Heritage Trail project on Tuesday, October 2, from 7:00 to 9:00 pm at the Woodside Town Hall. You can also take an online survey.